Hunting with a decoy is more effective, because with the help of semolina you can successfully imitate the voice of a grouse. In this case, the bird is getting close enough, and you can even hit it with a hunting slingshot. Purchased decoy is usually made of metal or plastic , less often of wood. It is a small tube type whistles. One purchased decoy does not always guarantee success, therefore it is recommended to purchase 2-4 pieces at once in order to choose the best sound quality in nature. Professional grouse hunters know that their decoy with a specific sound is needed not only to attract male grouse or female, but also for their brood. Therefore, in the hunt, you must have a few decoys. Nowadays, hunting for grouse becomes especially popular , since its number does not decrease compared to other wild birds. Grouse meat is famous for its tenderness and excellent taste. One of the best means of hunting for grouse is the use of semolina . Of course, you can buy it, but it is cheaper and more interesting to make it with your own hands. Grouse is usually hunted, either incidentally or purposefully. In the first case, those grouse who accidentally took off with another scared bird are shot back. Such a hunt for hazel grouses is not very effective. 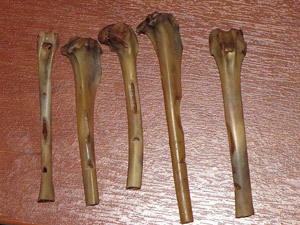 At home, the decoy for a hazel grouse is usually made from forest twigs, hare or duck bones, and even from a medical syringe . The dimensions of such mancoes: length – 2-6 cm, hole diameter – 4-6 mm. The decoy can be made from a pine branch, which is better to cut in the spring. The length of the twig is about 5 cm, and its diameter is 5 mm. Carefully remove the bark. Use a knife to make a small resonator hole. The depth of the hole must be increased gradually, because it affects the clarity of the sound. Then we make a longitudinal section on the branch so that the sound can pass. Made decoy leave to dry until autumn. You can make a decoy grouse from a piece of wire with insulation . To do this, cut off a piece of wire in 5-6 cm, and free the insulation from the wire. At a distance of 2 cm from any edge of the insulation we make a cross-section 4-5 mm wide. Then cut 2 cm from the piece of wire and insert it into the front of the semolina, so that the incision coincides with the edge. After that, we take 30-40 mm of wire and make a ring with an inner diameter of up to 5 mm. Insert the wire with the ring in the back of the whistle (to control the frequency of the sound). Another way of making semolina for grouse is from a simple ballpoint pen . Take the longer part of the handle and saw off the threaded section. We cut the opposite end with a file to an optimum length of 5 cm. At a distance of 15-20 mm from the wide end, a hole with a diameter of 3-4 mm should be drilled. Then we take clay and put it inside the semolina. Using a needle, we make a tapered groove in the plasticine. It should be a fine threshold, which determines the purity and volume of the whistle. It remains only to drill a hole for the lace. 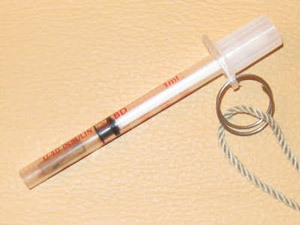 The original method of manufacturing semolina on grouse from a medical syringe with a cover . You will also need a pencil, glue, sandpaper and carpentry knife. First, take the cap from the syringe and cut off the sealed end . Then at a distance of 1 cm from the cut with a carpenter’s knife we ​​make a small hole. We take a pencil and make from it a blank for a cap up to 15 mm long. After that, carefully cut off about a third of this blank with a knife . 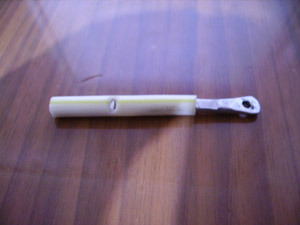 The remaining part is inserted into the cap so that the blank from the pencil was under the hole. Whistle and, having achieved the desired sound, glue the blank to the cap . The excess part of the cap is cut off . Next, use the remaining end of the cap from the first cut and insert it into the semolina . Fix with glue. Widely used by experienced hunters were decoys made from the femur of a hare or a goose . The front end of such a bone is cut vertically, while the rear end is at an angle of 45 degrees. Then the upper bone is cut with a diameter of 4-5 mm. 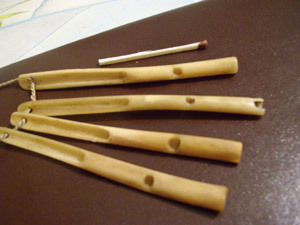 Insert the clay or wax into the resulting hole and make a funnel with a hot needle, constantly checking the sound quality. Decoy grouse can be made even of a can . To do this, we take a piece of tin and a metal plate 0.5 mm thick, 5 cm long and 5 mm wide. From the tin we cut a T-shaped billet and round it around the metal plate. The result should be a flat tube. Cylindrical resonator arched with a pencil. The front and rear of the cavity remain open. In the process of luring, they are clamped with the index and thumb. To make a high-quality decoy , you must learn to imitate the voice of grouse, and for this it is important to have a great “auditory practice . ” As a workout, it is recommended to record the grouse voice on tape and listen to it regularly. It is best to reproduce the female’s voice, since not only males will react to it, but also younger individuals (brood). Hazel grouse has a very delicate ear, therefore it notices any falsity . In this case, it does not fit the bait. Hunting grouse on the decoy is as follows. In late summer and early autumn, the hunter must determine the main habitats of grouse . It is necessary to move extremely cautiously through the forest, as grouse is very shy. From time to time should give voice through the decoy. If the hunter heard the return whistle of a grouse, you should stop moving and hide in the shelter, continuing to call grouse with the help of semolina. Hazel grouse can fly from tree to tree or run along the ground. The hunter should be the first to notice the bird and immediately shoot. Hazel can close let the hunter and fly up in 10-15 steps from him. If the latter missed the moment of the shot, he still has chances to shoot the prey. The fact is that the hazel grouse flies in a straight line and initially sits on the lower branches of the trees . If you scare him away again, he flies and sits on the branches of the next tier. Thus, the hunter has several opportunities for a shot . The key to successful hunting for grouse is good weather . In calm and windless weather, the whistling semolina is heard far away. To call grouse whistling is better standing, since such a position gives a good overview and allows you to quickly raise the gun. There are cases when grouse does not approach the hunter, although it gives a vote in response. This occurs when grouse are paired or with a brood. In this case, the hunter may try to approach the grouse itself, although this is fraught with great difficulties. At the slightest danger grouse takes off, because it reacts sensitively to the slightest sound. It is quite difficult to get into a hazel grouse because it skillfully maneuvers in the dense foliage of trees. It is extremely exciting hunt for grouse with semolina. It is incompatible with vanity and nervousness.Imitating whistling grouse requires even musical preparation. All this indicates that this type of hunting is “highly intelligent”.